See more information about the Montclair Film Festival and all its great events at MontclairFilmFest.org. View more photos at the MontclairFilmFest Flickr. Is it surprising that Montclair, which was ripe for a film festival that has already demonstrated success in its toddler years, was also the childhood home of two more rising stars? 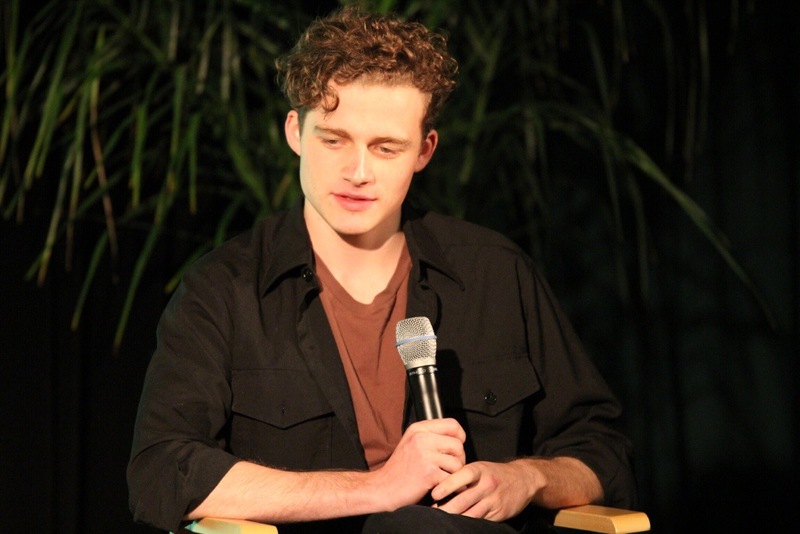 Actors, Kristen Connelly, known for her role as a Congressional staffer on Netflix’s House of Cards, and Ben Rosenfield, who joined HBO’s New Jersey based period drama, Boardwalk Empire, returned to town on Friday to participate in an aptly titled conversation, Homegrown. The young performers discussed their Montclairian roots and the trajectory of their burgeoning careers. In addition to growing up in a town where they could cross paths with talented people everyday, both Kristen and Ben found inspiration in their families. Kristen’s brother has found success both as an actor and now as a playwright, whereas Ben’s mother is an actress and therefore the art form has always been a part of his life. They also each took advantage of local acting opportunities; for instance, Kristen and her siblings participated in Essex Youth Theater and Ben took acting classes before they got their first break. Fittingly, Kristen earned her “first little break” at home when a film location scout rang the Connelly’s doorbell. She was a bit taken aback when her mother informed the scout that her daughter was an actor. Thankfully, an uncomfortable moment blossomed into a fortunate fluke because the scout provided her with an audition through which she earned her first paid acting role in the film, Mona Smiles. On the other hand, Ben asserts that his first break was the biggest he will have as he made his debut in 2011 as part of the Off-Broadway Atlantic Theater Company’s four person cast, Through the Glass Darkly, directed by Tony Award nominee, David Leveaux. This was certainly was a pivotal moment in Ben’s career as it led to a connection with his current agent. Rosenfield and Connelly appreciate the prevailing freedom in the entertainment industry that allow actors to move somewhat fluidly between mediums. Having credits in film, television and the stage, they have been able to enjoy the flexibility to experiment with their craft in a variety of ways. The public will soon be able to view them again beyond the small screen; Kristen will be featured as Desdemona in another Shakespearean production in an outdoor arena and Ben can be seen on the silver screen in the fall. Although they each have a multitude of projects in development, they are still currently in steady television roles (given that Ben’s Willie Thompson character does not get killed off in the volatile prohibition period of the Atlantic City crime series) and they expressed significant admiration for the veteran actors in their respective casts. Similarly, Kristen shared her deference for House of Card’s Kevin Spacey; she not only regards him highly for his acting abilities but also for his conduct on the set. She appreciates when people not only fulfill the expectations of their roles, but also demonstrate a respectful character in interactions with all of their colleagues. To her, Spacey exemplified this particularly when he refused to shoot at a point when the crew had been overworked. 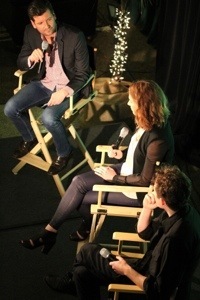 During the Q&A, Connelly and Rosenfield provided novel advice for an aspiring actress in the audience. Ben prescribed that she find a strong acting class that will provide her with an opportunity to network and Kristen lauded the benefits of being a member of an artistic community such as Montclair. The featured actors also exalted the value of the internet in forging a path into the field. Ben advised, “Don’t be held hostage by the idea that you need to audition; make your own work,” which is what Kristen did with her peers after graduate school when they created their own web series on YouTube. Spiky pink hair, fiery orange curls and oversized silver cuffs. No, Advanced Style is not about adolescents experimenting with their identify, it’s about mature women asserting their character through the art of fashion. In a culture that equates aging with fear, each of the women highlighted in this documentary confidently and unabashedly take joy in uniquely presenting themselves in their advanced stages of life. And many of them do so in very vibrant, living color. Advanced Style begins with photographer Ari Seth Cohen, approaching well dressed women in Manhattan to include on his now renowned blog by the same name. At the behest of his own cherished grandmothers, he had moved to the city in search of inspiration and he found it in older women who consciously or inadvertently have used the city’s broad avenues as their personal runways. As he “roam(s) the streets of New York for the most stylish and creative older folks,” he focuses on women who embrace their advanced age. Through these images, he celebrates their styles and seeks to shift the prevailing notions of how beauty and style is marketed to us in our culture. 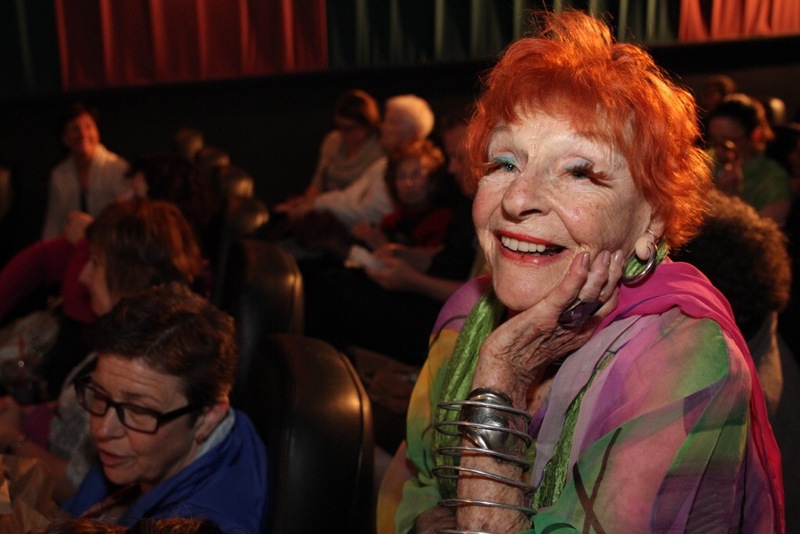 The film paints portraits of six vibrant women from sixty-two to ninety-five who Cohen has featured; it provides insight into the art of their styles, their backgrounds and their strength in embracing their own aging despite its inherent challenges. The women’s styles are a reflection of their individual personalities and backgrounds. Among the ladies is a spunky eighty year old owner of the Off-Broadway Boutique with a penchant for elaborate accessories and her more refined counterpart whose outfits often consists of more subtle colors and accents such as her signature strand of pearls. Director Lina Plioplyte and two of the films subjects attended the showing. Eighty-one year old Jackie “Tajah” Murdock’s long, lean frame is a reminder of her years as an Apollo Theater dancer. She was pleased to pose for a full length photograph in an elegant white pant suit embellished with gold designs in front of the step and repeat. Ilona Royce Smithkin, at 93, seemed to bask in the spotlight and had adorned herself with a palette of colors. Despite her short stature, the successful visual artist stood out in the crowd with her fiery hair and her signature long eyelashes. Fortunately, Ms. Smithkin and Ms. Murdock had plenty of energy for the Q&A segment. Montclair warmly received the women, giving them a standing ovation as they approached the front of the theater with Plioplyte for their interview with MFF’s Executive Director, Raphaela Neihausen. The sentiment of the first comment from the crowd was echoed by other women and the twenty-something director, “I think that every women who is mourning their youth should see this; it was such a joy.” The women and the presentation of Advanced Style not only challenge the fashion world but, also, our own perception of self as we age. These women are proof that life after sixty can be fashionable and fabulous!